In February 2010 I bought a HTC Hero model of Android mobile phone running Android 1.6. 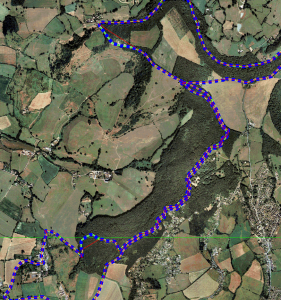 Within a few weeks I discovered the excellent Oruxmaps application which I installed and used with very few problems for 2 years. During that time I upgraded Oruxmaps many times, using both the market versions and many of the beta versions. I also upgraded Android on this phone to version 2.1 and rooted the phone in both versions. At the end of the contract for this phone I bought a new shiny Samsung Galaxy S2, running Android 2.3.4. I immediately installed my favourite application Oruxmaps on it and copied all the configuration files from my old phone to save having to set it all up again. Immediately after I started using the Galaxy S2 I noticed that it seemed to leave gaps in the tracklogs. Sometimes the track would break, leaving a gap and other times Oruxmaps would join up two parts of the track with a straight line, sometimes over a very short distance but sometimes over several hundred metres or more. 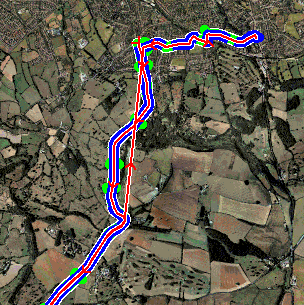 Simultaneously tracking the same bike ride or walk with my old HTC Hero over the same route would produce a very much more accurate tracklog. Over a 20 mile bike ride the Galaxy S2’s track log would often be about 2 miles (3km) too short but the Hero’s log was fine. I normally use “Direction Up” under Map orientation. However, on the S2, since enabling static navigation I notice that the map moves around constantly when stading still. This doesn’t happen on the Hero. Most of the time I leave the phone in my pocket and just take it out to check from time to time. 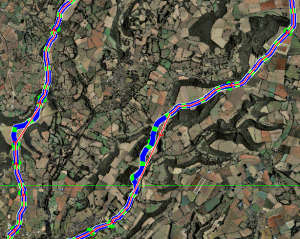 In the first screenshot Oruxmaps seemed to have completely lost its way (producing the long red one) until I got the phone out to check, at which point it started logging again. 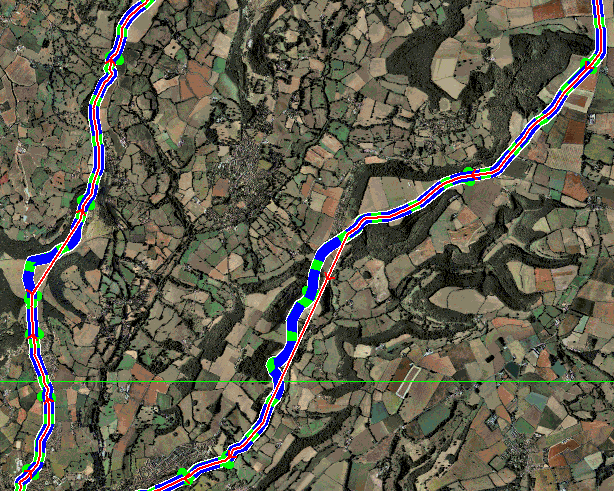 The screenshot below shows the more accurate track in green from the HTC phone and the Galaxy S2 on the same day in blue. 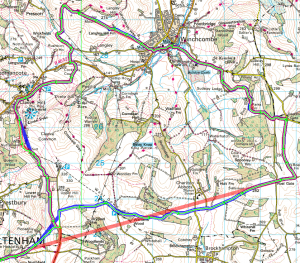 The red track log is the same route a few days later. 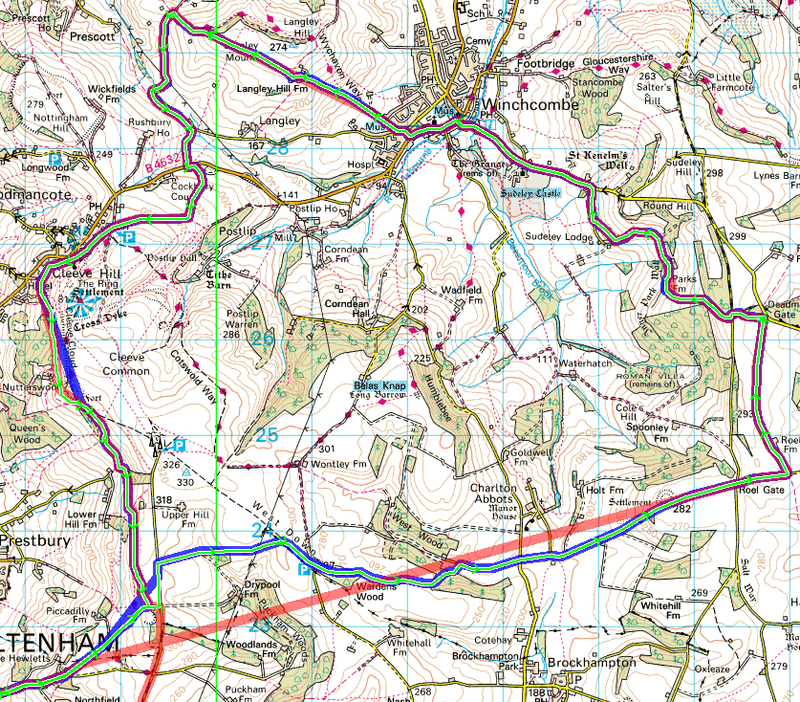 As you can see this time the straight line produced was much worse! All these tracks were recorded after applying the static navigation fix. Since discovering this problem I have enabled the voice announcements every mile and the sound to notify you if the GPS signal is lost. During the ride with the long straight section in red above, the announcements stopped for several miles until I took the phone out of my pocket to check it. Oruxmaps did not make the sound that I had set up to say it had lost its fix. 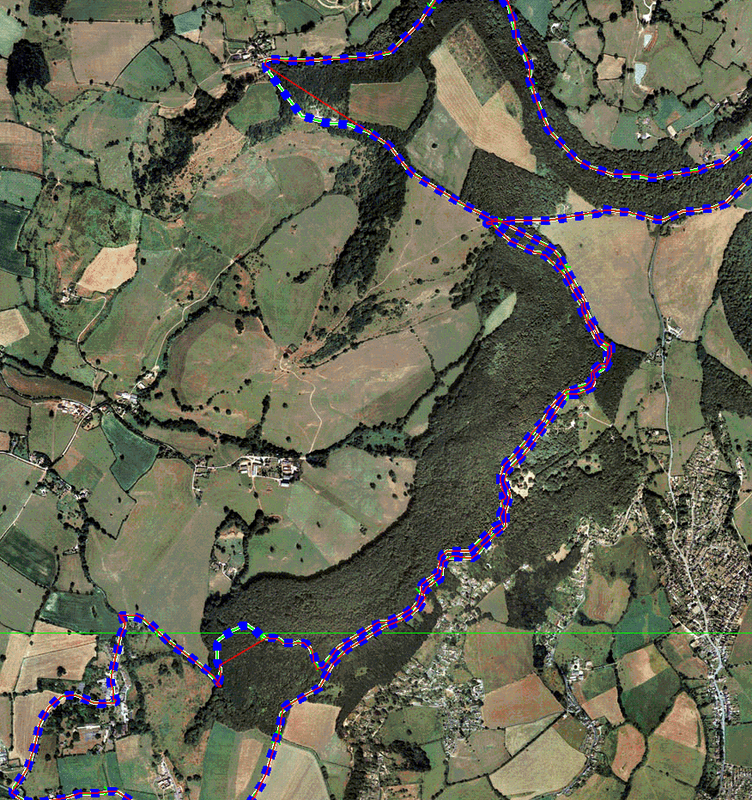 Since reading this article in the forums about losing the GPS signal I decided to try a couple of other GPS applications. I chose Locus (as this is the one tested by Stefanos for testing his GPS) and OpenGPS Tracker to record my tracks at the same time as Oruxmaps. The results of the two bike rides that I have tested so far suggest that the phone is working OK but that Oruxmaps has problems with the GPS.